This image, captured by the NASA/ESA Hubble Space Telescope, shows what happens when two galaxies become one. The twisted cosmic knot seen here is NGC 2623—or Arp 243—and is located about 250 million light-years away in the constellation of Cancer (The Crab). NGC 2623 gained its unusual and distinctive shape as the result of a major collision and subsequent merger between two separate galaxies. 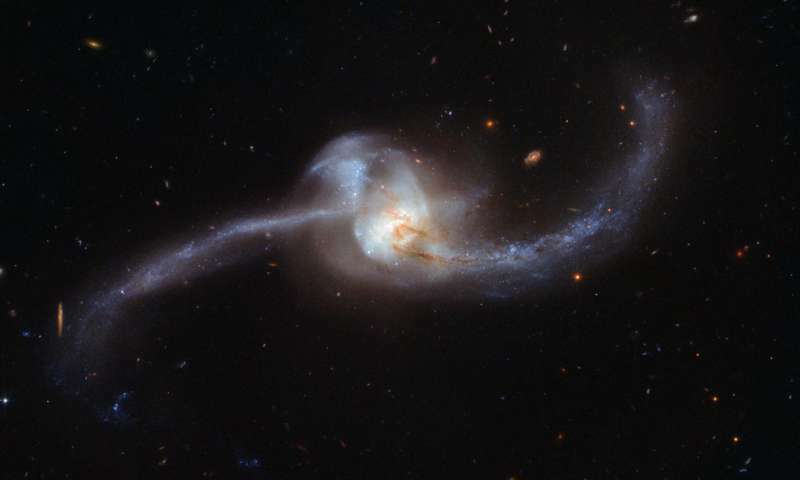 This violent encounter caused clouds of gas within the two galaxies to become compressed and stirred up, in turn triggering a sharp spike of star formation. This active star formation is marked by speckled patches of bright blue; these can be seen clustered both in the center and along the trails of dust and gas forming NGC 2623's sweeping curves (known as tidal tails). These tails extend for roughly 50 000 light-years from end to end. Many young, hot, newborn stars form in bright stellar clusters—at least 170 such clusters are known to exist within NGC 2623. NGC 2623 is in a late stage of merging. It is thought that the Milky Way will eventually resemble NGC 2623 when it collides with our neighboring galaxy, the Andromeda galaxy, in 4 billion years' time.